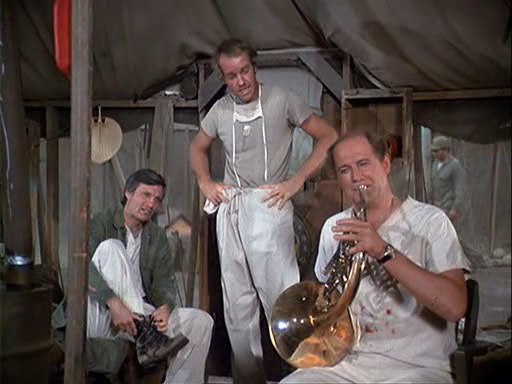 TODAY WE COVER Season 6 Episode 16 "The Smell of Music"
PLOT SUMMARY: The 8th Army commends the 4077 for the 72-hour ordeal they withstood. Even the good Father is exhausted. All Hawkeye and BJ want is a shower and sleep. But, Charles wants to blow his French horn, loudly. Colonel Potter tries to deal with a suicidal GI, Pvt. Saunders, who lost part of his face and requires plastic surgery. Hawkeye and BJ refuse to use soap and water until Charles stops his horn playing.